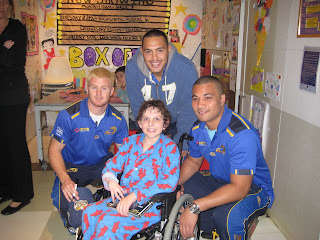 Hi Guys - I am in hospital at the moment for some checkups and got to meet some of the Parramatta Eels. They came to Radio Bedrock at the hospital - they came with Ben Iken and they were all really nice guys. They played a football game and had a footy quiz where you got to win tickets to some NRL games. Guess what I won tickets to the Souths and West Tigers game - I can take my pop cause he goes for the Tigers. I got to meet three of the players - Feleti Mateo, Chris Keating and Junior Paulo. These are some photo's with them. They were really really nice guys and had a talk with me. 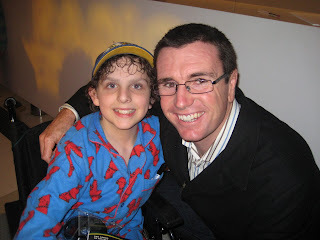 I liked meeting Ben Iken as well - he used to play for the Bronco's ( my number 1 team ) so he is a good man ! !